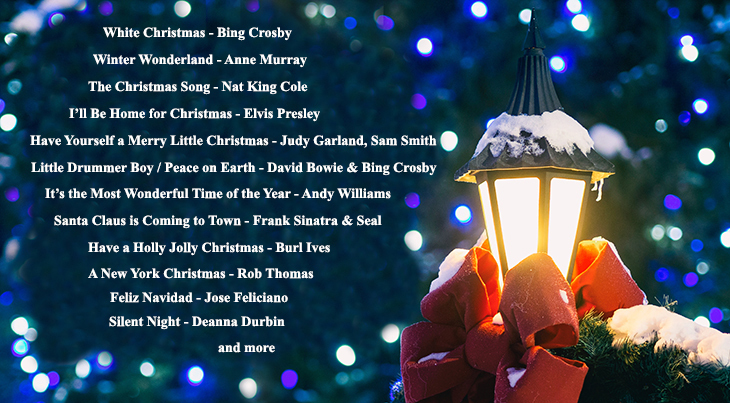 Thirteen of the best old & new Christmas songs, performed by favorite singers in these classic film clips and live performances. If you are a senior or baby boomer, you couldn't have missed seeing Bing Crosby in a classic Christmas movie at the theatre or on television. Two of his movies featured his arresting version of White Christmas: Holiday Inn (1942), and White Christmas (1954). Below, Bing Crosby sings his classic White Christmas to co-star Marjorie Reynolds in 1942's Holiday Inn. New York City at Christmas time has been a popular theme in movies, from senior citizen and baby boomer favourites like Miracle on 34th Street (1947), to more modern favourites like Trading Places (1983), Home Alone 2: Lost in New York (1992), and The Night Before (2015). Below, Matchbox 20's Rob Thomas performs his original song A New York Christmas (2003) live at Rockefeller Center. Whether you're a senior or baby boomer (or not), you may like It's the Most Wonderful Time of the Year, written by Edward Pola & George Wyle in 1963. Below, Andy Williams sings his take on the up-beat Christmas song It's the Most Wonderful Time of the Year. As millions of 50+ baby boomers & seniors will remember, Burl Ives sang Have A Holly Jolly Christmas (composed by Johnny Marks in 1962) in the animated TV Christmas-special film Rudolph the Red-Nosed-Reindeer(1964). Both the film and the song became seasonal favorites. Burl Ives sings Have A Holly Jolly Christmas in a clip from Rudolph the Red-Nosed-Reindeer, below. What do you get when you meld two beautiful Christmas songs and two unlikely performers in a duet? An instant Chrismas classic. Little Drummer Boy (Carol of the Drum) was written by Katherine Kennicott Davis in 1941 and arranged in 1958 by Harry Simeone. I Heard the Bells on Christmas Day is a Christmas carol based on Henry Wadsworth Longfellow's 1863 Civil-War era poem Christmas Bells, and contains the closing verse "Of peace on earth, good-will to men!" at the end of each stanza. Bing Crosby's last television special was filmed in London in 1977, with special guest David Bowie, and spawned this "modern" favourite duet - Little Drummer Boy/Peace on Earth. Although both David Bowie and Bing Crosby are gone now, special moments and songs like Little Drummer Boy/Peace on Earth live on in video for us to enjoy. When men of good will live in peace, live in peace again. Since Austrian composer Franz Xaver Gruber wrote Silent Night in 1818, it's been a Christmas favorite - recorded and performed by countless choirs and solo artists. In the delightful romantic murder mystery caper film Lady on a Train (1945), leading lady Deanna Durbin is away from her father at Christmas time. At his request during a phone call, she sings this beautiful version of Silent Night to him. Have Yourself A Merry Little Christmas - Judy Garland, or Sam Smith? Courtesy of the incandescent Judy Garland and the classic movie Meet Me in St. Louis (1944) - the song Have Yourself a Merry Little Christmas (written by Hugh Martin and Ralph Blane) was first introduced to Christmas music fans over 70 years ago. Below, in a scene from Meet Me in St. Louis (1944), Judy Garland sings Have Yourself a Merry Little Christmas. How does Judy Garland's version of Have Yourself a Merry Little Christmas compare to Sam Smith's version in 2014 (below)? Singer-songwriter José Feliciano's classic Christmas song Feliz Navidad was first released by him in 1970. Below, an older José Feliciano gets some help from former Hall & Oates singer Daryl Hall in 2010, to sing Feliz Navidad. Songwriters John Frederick Coots & Haven Gillespie wrote Santa Claus is Comin' to Town during the Great Depression in 1934, and it was first heard when Eddie Cantor sang it live on his radio show. Cantor added extra verses, asking his listeners to help others at Christmas. Today it's a Christmas standard. You may be a traditionalist and like Frank Sinatra singing Santa Claus is Comin' to Town; or perhaps you're a Seal fan? Here you get the best of both as Seal and Frank Sinatra magically combine forces in a digital duet version of Santa Claus is Comin' to Town, below. First written by Felix Bernard and Richard B. Smith in 1934, Winter Wonderland quickly became a favorite holiday tune and has since been performed by hundreds of artists. Dean Martin, Connie Francis, Perry Como, Johnny Mercer, Doris Day, Johnny Mathis, and many others have included Winter Wonderland on their Christmas albums. Below is Canadian songbird Anne Murray's signature version of Winter Wonderland. Seniors may remember when Bing Crosby's recording of the sentimental I'll Be Home for Christmas (1943) was first released. While World War II raged on, songwriter Kim Gannon (with credit also to Buck Ram) said he was thinking of all people not able to make it home for Christmas, not just soldiers, when he wrote I'll Be Home For Christmas. Although it was among the most requested song at USO shows during the rest of WWII, the BBC banned the song from broadcast in the U.K. for fear it would lower the morale of troops. To the dismay of Elvis Presley fans, some fourteen years later it was announced just before Christmas 195,7 that Elvis would soon begin serving in the U.S. Army (Presley served from 1958-1960 as a regular soldier). Elvis Presley included I'll be Home for Christmas on his Elvis' Christmas Album (1957). Wonder what Christmas was like over 100 years ago during World War I? A Silent Night (Christmas 1915) was written by Irish singer-songwriter Cormac MacConnell in 1991, some 70+ years after the end of WWI; the original title was Silent Night - Christmas in the Trenches 1915. A Silent Night (Christmas 1915) ties together refrains from popular Christmas carols, the reality of World War I for soldiers, and the remarkable story of the historical Christmas truce/ceasefire between the British, French, and German troops. On Christmas Eve 1914 along different points of the western front of World War I, "the guns all died away". Soldiers from both sides played games, sang carols, and in some cases exchanged prisoners, food, and souvenirs. The Christmas Truce was repeated in 1915. This hauntingly beautiful music video of A Silent Night (Christmas 1915) features the Celtic Thunder singers. Singer Mel Tormé co-wrote The Christmas Song / Chestnuts Roasting on an Open Fire with Robert Wells in 1945, r,eportedly in an attempt to try to cool down in the hot summertime. The Christmas Song / Chestnuts Roasting on an Open Fire became a signature Christmas song for Nat King Cole when his version was released in 1946. Below, Nat King Cole performs The Christmas Song.